The IP Hall of Fame honours those who have made an outstanding contribution to the development of IP law and practice. Devised and developed by leading IP publication IAM, it identifies individuals who have helped to establish intellectual property as one of the key business assets of the 21st century. 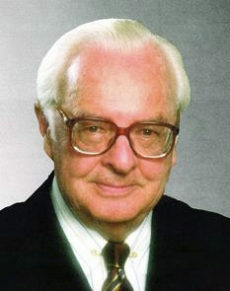 Bogsch was the Director General of the World Intellectual Property Organization (WIPO) from 1963 to 1997, as well as serving as Secretary General of the International Union for the Protection of New Varieties of Plants. Under his direction, WIPO expanded its role and influence in the world of industrial and intellectual property. Bogsch launched a multitude of groundbreaking initiatives, notably by advocating the conclusion and revision of numerous international treaties, launching an ambitious programme of assistance to developing countries, modernising the system for the international registration of marks, creating the WIPO Arbitration and Mediation Centre, and presiding over the baptism of ATRIP, a world association of intellectual property teachers and researchers. He was also the father of the Patent Cooperation Treaty. In addition, he contributed extensively to providing China with a modern intellectual property system and welcoming it into the international intellectual property community. Similarly, when the Soviet Union broke up he actively assisted the countries that emerged to create their own national systems and, as far as most are concerned, to build up a common patent regime through the Eurasian Patent Convention.